A new Monmouth poll has Democrats +7 on the generic ballot. AL-GOV: Kay Ivey says Trump tariffs will hurt Alabama’s economy. CA-GOV: John Cox says he opposes family separations at the border. CO-GOV: Democrats in the governors’ race sparred over campaign finance in their final debate. Here’s the Denver Post’s recap. FL-GOV: Jeff Greene is using a confrontation with Trump at Mar-a-Lago in his introductory ad campaign, per POLITICO. Philip Levine says he’ll put his assets in a blind trust if elected. 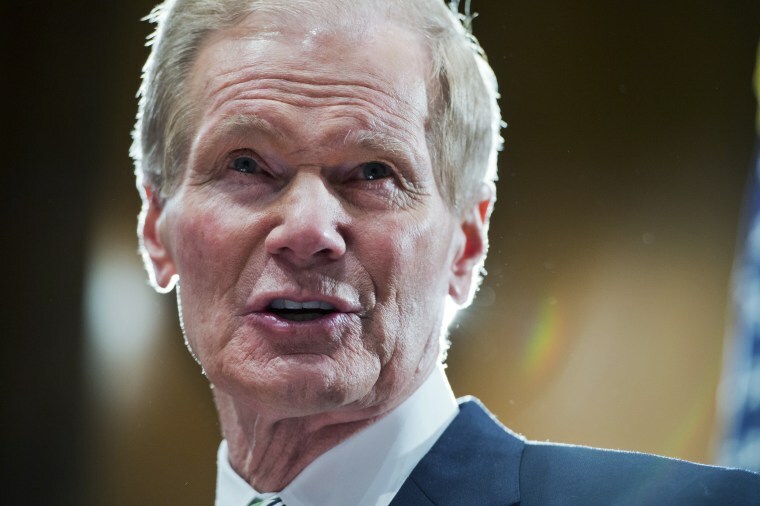 FL-SEN: Bill Nelson will visit a federal shelter housing young immigrants as the border crisis heats up his race. And Rick Scott’s upcoming financial disclosure is fueling questions about his assets in the energy industry — and how they may have influenced his policy positions. MO-SEN: A Democratic poll has McCaskill up six. MN-SEN: This Richard Painter ad is just … well, just watch it. NJ-2: The surprise GOP nominee in New Jersey’s 2nd district is causing trouble for his party over his views on race. NY-GOV: Stephanie Miner is making an independent big to challenge Cuomo. WI-SEN: Leah Vukmir referenced death threats against her and her family in her opening ad. WI-GOV: Scott Walker is calling himself an “education governor” in a new ad. Julia Ainsley reports that the Trump administration discussed separation of families as a deterrent as early as February 2017. All four living former first ladies have now condemned the border policy. The New York Times does a deep dive into how Jeff Sessions and Stephen Miller became the driving force behind Trump’s immigration policy. A conservative group is making a new push to repeal the ACA, writes the Wall Street Journal. Kim Jong Un is in Beijing. Trump is continuing to escalate the trade war with China, threatening tariffs on some $200 billion in products. The Senate rebuked Trump with a vote to reinstate the ban on selling U.S. parts to ZTE. Paul Manafort is getting “no special privileges” in jail.